The first shipment of "Love" the new fabric line from Amy Butler arrived this week. Amy Butler fans will notice that the colors are a little bolder, and the patterns are new and exciting. We are expecting the remainder of our order the first weeks of December. The extra exciting thing about this new line is the coordinates that Ms. Butler has provided across fabric types. Several of the patterns will be available in home decorator weight, flannel, broadcloth and laminated cotton. Only 3 more days to see the fantastic garments from the Oliver + S trunk show. the Jump Rope Dress and the School Days Jacket shown here as a rain coat made up in laminated cotton. And for the boys in your life, Sailboat Top and Pants and the oh-so-darling Bedtime Story Pajamas Don't miss out on the 10% discount on patterns for the duration of the Trunk Show. We have to send these darlings home on November 1st. The Oliver + S Trunk show has begun. Please stop by and see the adorable-ness. 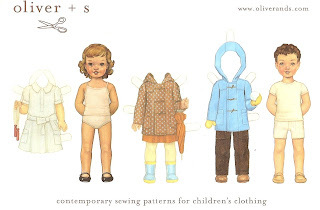 Oliver + S patterns will be 10% off for the duration of the trunk show. Garments are not available to try on. We have some new goodies that I am excited to share with you today. We recently received a couple of printed lawns from Liberty of London. They are just the right weight for a blouse, and just enough wit in the patterns to be fun and funky! It's Sale time at Treadle Yard Goods. Our Fall Sale runs October 1st through October 11th. All fabrics are at least 10% off with selected groups at 20-50% off. We are also deep into the holiday sewing season. We have a delightful assortment of fabrics for your favorite fall and winter holidays. "Halloween Hunks" from Alexander Henry "fiesta de los muertos" also from Alexander Henry and I know it's early but I can't help but share the Yule Critters from Michael Miller.